Re: $30 Rain Collector Heater - simple!! For $2 more I can have a digitally controlled, settable one. But anyway I'm not in the US so I would find it hard to get one here. (I usually write prices in $ for easy comparison.) But to be honest there're some similar devices around here too, but I can get the mentioned digital one at a local auction site anew for cheap so why bother. Post the type and model that would work. Everything I found that was digital wouldn't survive -30F below. EDIT: for the SCT-100 temperature controller the operating temperature is 0-60 °C according to the manual, so, well, this is a kind of a bet. I'll report back after I'll have it installed and freezing temps kick in again (right now it's barely above freezing). Thanks, thats what I found also. I would need to heat the housing for the controller adding more issues. 20-30 below isn't that uncommon. -39 below in 1989. My controller is in an unheated garage. The sensor wire passes outside of the garage and the sensor itself is hidden beneath a decorative shutter. The coldest that I have seen in the garage is about 12°F (-11°C). The garage is a few degrees above the outside ambient. So far it has been functioning properly, no issues. They may be using "consumer" grade parts (0°C to 70°C). If you are installing the controller outside (in an weatherproof enclosure I hope), this might be an issue. That's correct it would need to be inside the shelter outdoors. The main power supply fed from the garage primary use is for the electric fars needed 24/7. The thermo cube inside the shelter is sufficient for the heater. Well, I plan to put it in the small workshop which is in a separate unheated building, actaully part of the garage building separated with a wall. So the temps are essentially like the temps outside, but protected from the weather. 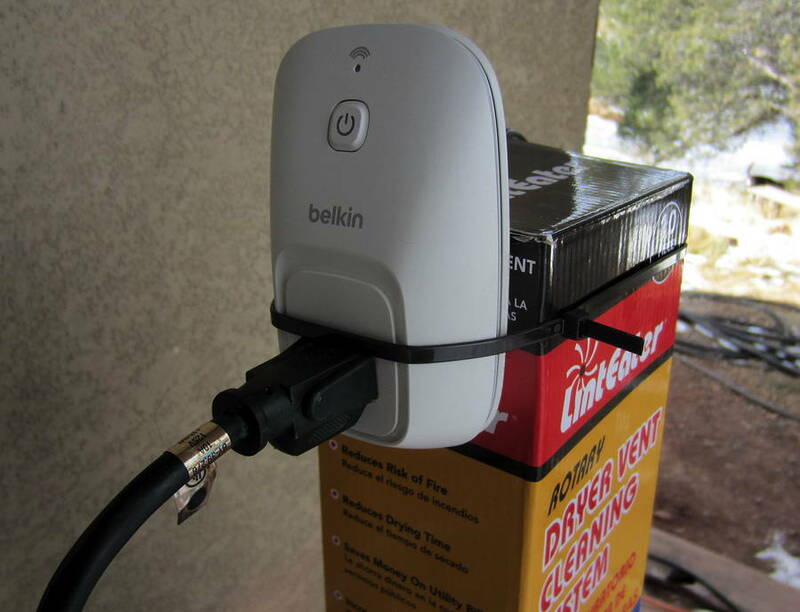 I've been experimenting with an automated wireless solution to control my rain gauge heater using a Belkin WeMo Switch (or new Mini Plug). To find out if the WeMo switch could handle cold outdoor temps, I made a temporary mount and placed it as close as possible to my WiFi router located inside the house. The WeMo is positioned underneath a porch roof, protected from direct moisture, elevated for better WiFi reception and is about 50ft from the WiFi router, going through two walls. So far, the switch has withstood near zero temps without issue. If extreme outdoor conditions were a problem, obviously the WeMo could be mounted inside, routing the control cord through a wall. Not pretty, but it works for now. 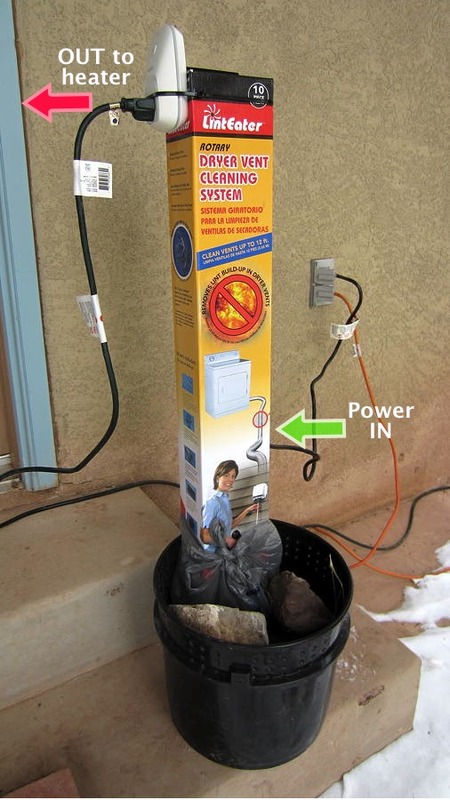 The power cord you see here runs to the rain gauge heater and the WeMo is connected in the back to a power cord running inside the cardboard box. I know this thread is old but it is awesome. I have read through all the pages to see what people have done to build their heaters. I too was concerned with the Davis heater because it gets so warm that I was afraid the water would evaporate before it was collected. I finished building my heater today. I used the technique of the OP but I changed the scotch tape for aluminum tape. There were areas where the tape wasn't sticking well, I may change it to duct tape in the future. I spent about $30 and I ordered everything from Amazon. Thank you for the great ideas and the post. No more scooping out the snow and then melting it. CWatsonJr, thanks for the kind words. As this approaches 100,000 views it might represent my greatest contribution to the world via the internet. I'm glad it all worked out for you. And I agree about the scotch tape. Not the greatest choice. Almost anything would have been better. At the time the original was meant more as proof of concept. The scotch has miraculously held up though. It's a weather rated, key fob operated electrical outlet. I keep the warmer switched off unless I know there is frozen precip in the forecast. I also used some carefully trimmed pieces of the foil backed foam to insulate the inside of the base of the collector as well. Just to improve the efficiency of the whole shebang. That's a good idea, I will insulate it some more as you stated. I was thinking of getting a wifi controlled outlet so I can control it from anywhere I have internet access. 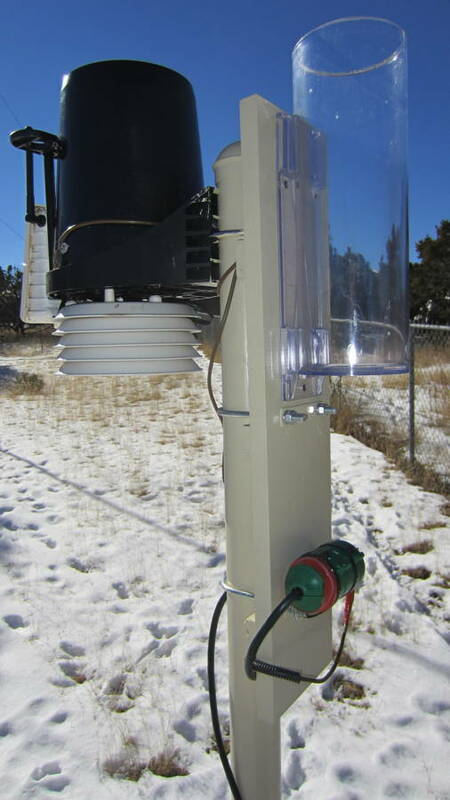 What about using an ardunio to poll weather underground for freezing temp and snow forecast. Then switch on the power to the heater through a relay? Sometimes it gets cold enough to snow and there is no precipitation in the forecast, so it would be wasted energy to turn the heater on when there wasn't a need. I just went with the $6.50 switchable outlet because it was rated to be out in the elements, and it appears to be very reliable. Wifi stuff tends to be a bit more delicate/finicky. They make a temperature controlled outdoor rated outlet called a thermocube that turns it on and off via baked in presests but that also keeps it on a lot of the time that there isn't precipitation. For another option... The WeMo Wifi controller (~$30) mentioned in my post above has been living outside in sometimes below zero temps for the past four winters without issue. 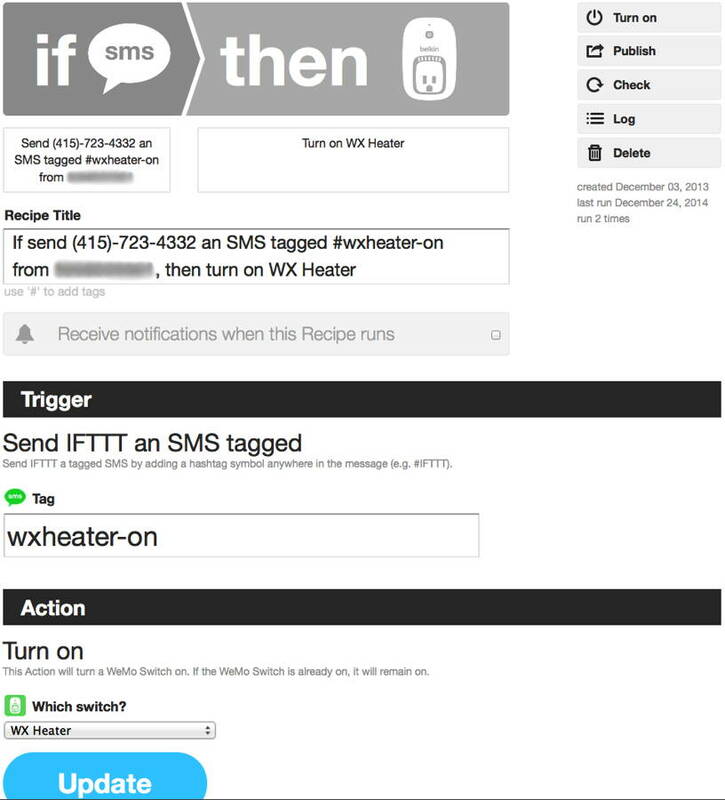 Paired with IFTTT (which now uses WeatherUndergound), it has accurately turned the rain gauge heater on when it began to snow and off again when the snow stopped, give or take a couple of hours. 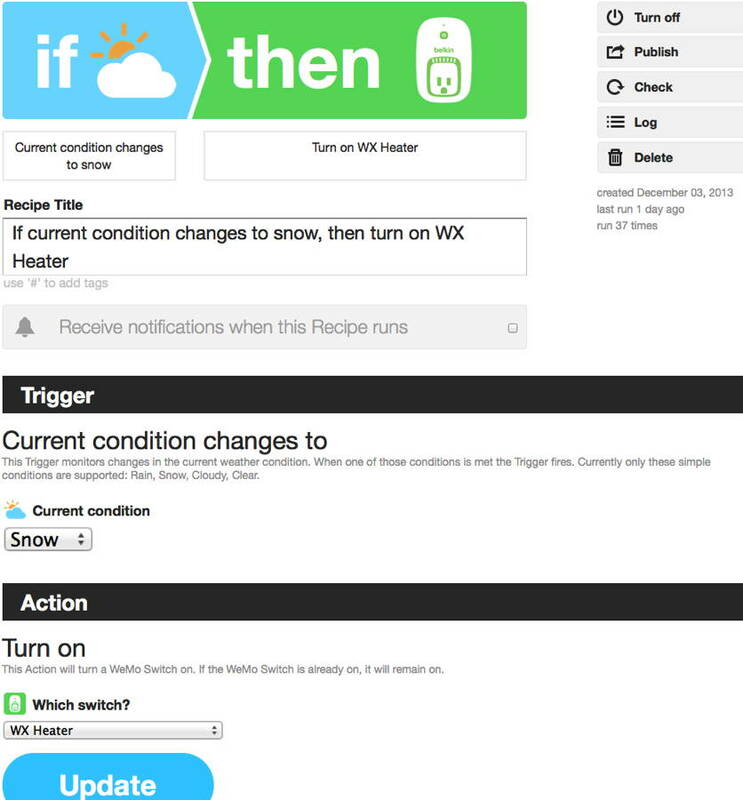 (To control the OFF command, you need to create three recipes, one each for current conditions that are clear, cloudy or rain.) ... Sometimes for several hours there is snow in the general area, just not at my house, so WU/IFTTT does not generate the OFF command. 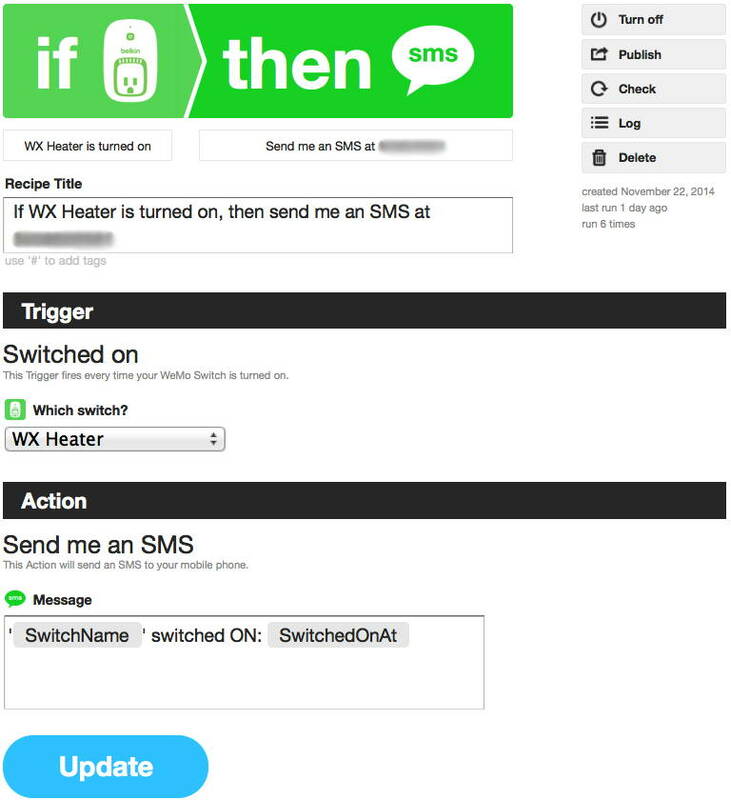 For those infrequent occasions, I pick up my phone, open the WeMo app and turn the heater off. Of course, it would not be a big deal if the heater were to remain on for a while after the snow has stopped as outdoor temps will generally be near freezing during these times. That is the setup I'm looking at. 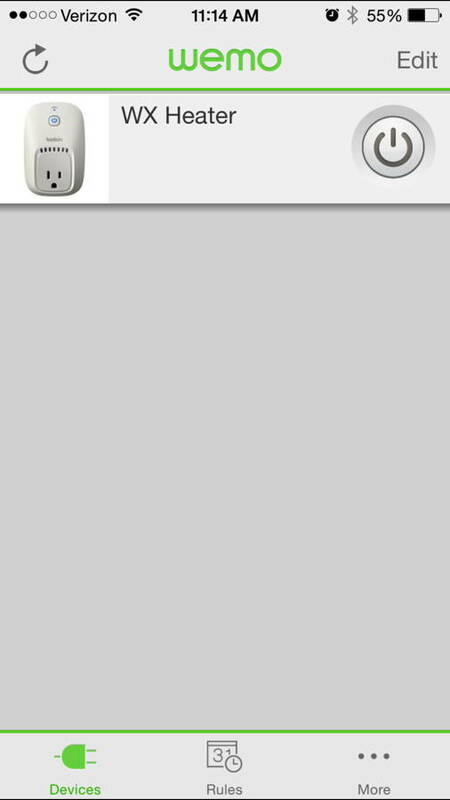 I'm looking at placing the wemo plug in the socket on our back deck. It isn't completely protected but it has the roof overhang to protect it some. The plug will be about 10 feet from the ISS so I won't need to run a lengthy extension cord. I dropped by Fry's electronics but their selection was dismal at best. I think I'm going to have to go to Amazon for this too. My problem will be the anemometer. I want to place it on the apex of the roof, I just don't know if it will reach. If I remember right, there is 40' of wire for the anemometer. We are down a slope and completely surrounded by pine trees, so getting accurate wind readings just isn't possible but if I can get the anemometer as high as possible (without climbing a 200' pine tree) I can at least get the wind reading for what is reaching the house. Thank you again for all the great ideas! Just make sure the plug where you intend to locate the WeMo Switch gets a decent WiFi signal from your router. I had to elevate mine and place it near a glass door. Also, I would be concerned if your chosen location for the Switch is not completely protected from moisture, as they are not intended to get wet. A simple roof overhang does not sound sufficient. You may need to purchase/construct some sort of enclosure for it. Or, just relocate the Switch to a protected area as I did and run extension cords as needed. About your anemometer wire.. yes, it does come with 40ft of wire. But, if that's not long enough, you can easily extend it. Davis sells extension kits for this purpose, or you can buy the needed items elsewhere. Search this forum for more information.. this topic has been discussed many times. .. You also have the option of using the Anemometer Transmitter Kit to get your wind data to your console(s). Still... I think trying the 20 watt version first makes the most sense. Here are those interior shots of my rain bucket again showing how I coiled the cord around the cone. Notice that the end of the cord is at the top of the cone, right next to the hole where the water comes in. The very end is not heated and slightly larger in diameter. I let that "tip" hang in the air. No need to glue that portion down. I just rigged up mine just like yours. I did a few modifications. I used heavy duty foil and triple layered it using double sided tape before putting on the pipe wrap. My thought was extra insulation. I used the foil tape too instead of duct tape. I found it difficult to glue the cable wraps on the inside cone evenly. There's not much room to work and the darn cable is limp as a rag. I did a test tonight with the outside temp around 41. In an hour the inside temperature stabilized at 80. I used a wireless temperature transmitter to monitor it. I mounted a waterproof outlet box cover below my VP2 mount to house the thermocube and electrical connection to the extension cord. I found the box at Home depot. I got the duplex wide version with a flip up cover. One thing I thought you could do in a colder climate was insulate the floor of the tipping mount with strips of the pipe wrap. You could trim it to fit around the tipping mechanism and drains. Thanks for the idea Goose! Well over 7 years have passed and this homemade rain collector heater is still working great. I store it away during the warmer months by swapping it out with an extra collection cone. The only addition I plan to use is an outdoor z-wave switch controlled by my Nexia home automation system. That way I don't have to venture outside to plug or unplug the power supply. I was inspired by this thread, but I did things a little differently. My total cost was $15.25 for a 24 watt heater, not including a 12v 2.5A power supply that I had lying around. If I had to buy the transformer it might have added $8 to the cost. I used a 6 ohm, 50w load resistor ($4.98 for 2 on Amazon) combined with the 12v 2.5A power supply to provide 24W of heat. I also added a "Snap Disc Thermostat, Open On Rise, Range 105/115 F" ($6.98 on Amazon) for safety. I mounted the thing with some scrap wood, screws and sheet metal for heat shielding. I also needed to get some crimp on wire connectors ($3.28 at Lowes). I insulated the inside of the cone with small bubble wrap and thin aluminum foil. It has worked well with our recent snowfall. It kept up with melting the snow. The only issue I had was snow gathering around the top of the cone. I think the insulation may have been keeping the heat away from that area so I pulled it down a bit so that it will heat the top of the cone more. 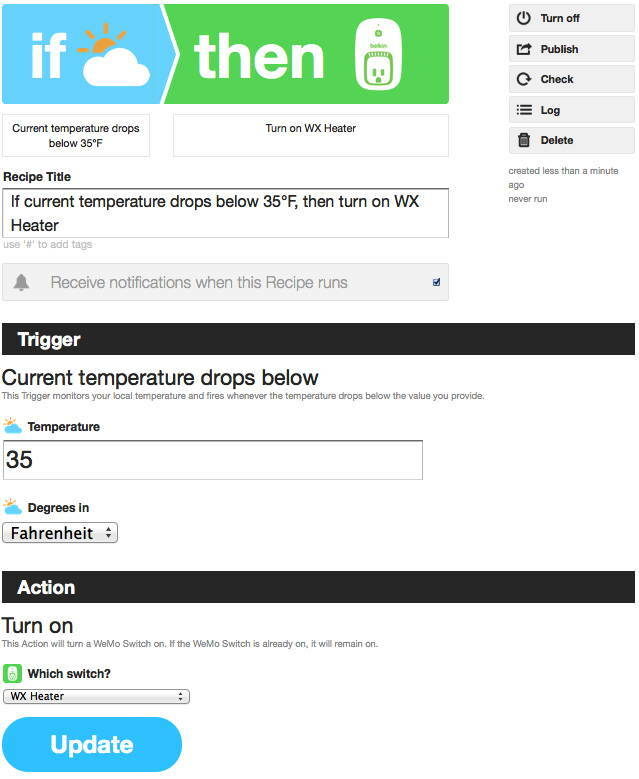 I also use a TP-Link Smart Plug and control the power to the heater with a script on my Raspberry Pi. I have a cron job that checks the current conditions and 3 hours of the forecast (wunderground API) and turns the heater on if there is snow/ice/freezing in the current conditions or forecast. It turns the heater off 1 hour after the end of the frozen precipitation. After several attempts of using different tapes, I have lost the battle of keeping the heating cord fastened to the insulation. I broke down and purchased the Davis heater for $150 at Scientific Sales. The last time the cord came loose, it got under the tipper and kept it from recording. Oh well. It was a fun experiment. I am sorry to hear that. I used plain ol' scotch tape, which has not shown any sign of aging in nearly ten years. I used hvac foil tape. Interesting theme. I used multi layer. First a inox metallic mesh fitted with Sikaflex, this layer is for unify warm energy and protect the plastic. The problem can't remove. Second layer its two or three matrix of resistors of 1 Kohm for 3 w to 5 w power in 12v. I prefer divide power in 2 or 3 matrix for prevent any failure. This layer also fix with Sikaflex buy only points in resistors. Can use cheap 4 euro electronic thermistor for fix about 10°Celsius matrix temp. Also can add water detector for 3 euro.